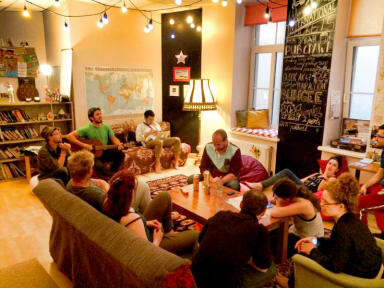 Cinnamon Sally Backpackers Hostel, Ryga, Łotwa : Rezerwuj teraz! One of the best hostels I have ever stayed. Best regards to British guy and Latvian from the staff members. Probably one of the nicest hostels I have ever stayed in. Great atmosphere, really nice staff members. I would recommend this place to everyone who is planning to stay in Riga!! The place really makes you feel like at home, and it never gets boring, because there are always lots of interesting people to talk to. I liked the spacious rooms, the cozy living room and also the kitchen is very covenient. I think it's a special place. Świetny hostel z bardzo dużymi i wygodnymi łózkami w salach wieloosobowych. Uśmiechnięty i pomocny personel. Polecam!